The data was added on ,	20 June 2017 read 462 times. The Syrian army troops continued their advances in Raqqa province and managed to regain control of several new regions and get closer to one of ISIL’s most important military bases West of Raqqa. The army troops managed to liberate Al-Aysawi village in fierce clashes with ISIL militants, and then launched an attack on Jaydeen which resulted in recapturing the strategic village near the key town of Resafa. The Syrian Army continued its military operations in Raqqa’s Western countryside, hitting several points that still are under ISIL’s control. 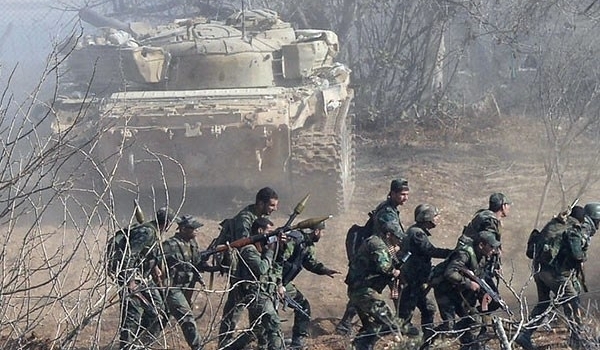 Before recapturing Al-Aysawi and Jaydeen, the Syrian Army had stormed al-Karadi to capture the village, and finally forced the Takfiri terrorists to retreat from another village in the province. A military source said that the airstrikes by the US-led coalition fighter jets on the Syrian army will not disrupt its anti-ISIL operations in Raqqa, adding that the Syrian army forces are now able to move towards the strategic town of Rasafeh from two directions in view of their advances in other areas. The source also said that several ISIL terrorists have fled Rasafeh due to the massive number of the army soldiers that are readying for an imminent operation to recapture the town, adding that there is a high chance for regaining control of the town without facing much resistance from the terrorists. In a relevant development on Sunday, the Syrian army troops took control of the towns of Banr al-Jaeq, Banr Mousa al-Hendi and Bahr Abu Hamat after fierce clashes with the ISIL terrorists in Western Raqqa. The gov’t forces also managed to recapture the towns of Mazafeh Awijan Bu Khamis, Banr al-Sadran, Akhu Hadleh, Haj Mofazi, Banr al-Adad, Banr Abu al-Sanabel, Banr al-Amaleh and Rajm al-Amaleh hill West of the strategic city of al-Rasafeh. Also on Sunday, Damascus announced in a statement that the US-led coalition has shot down one of its fighter jets during a mission in Raqqa countryside. According to the statement, the warplane was carrying out operations against ISIL in the countryside of Raqqa when it was targeted, leading to a crash and the loss of the pilot, who is currently missing. The Syrian army backed by the country’s air force continued its military operation in the Western part of Raqqa, after capturing ISIL’s last bastion in Eastern Aleppo and has captured several districts in recent days. As Washington claims that it fights against the ISIL group, US warships fired 59 Tomahawk cruise missiles from two warships in the Mediterranean Sea at the Shayrat airfield in Homs province on April 7, following a chemical weapons incident in Idlib province which the Western countries blamed on the Damascus government. The Syrian government has fiercely denied using or even possessing chemical weapons since the country’s compliance with the Chemical Weapons Convention was certified by international observers in 2013, as the world is still waiting for the US and its allies to provide any proof for its claims of Bashar al-Assad government involvement in the alleged chemical attack. Also on May 18, the US-led coalition struck pro-Bashar Assad forces near al-Tanf in the area of an established de-confliction zone. The coalition air raids occurred near al-Tanf, where US’ and British special operations forces have been training militants near the border with Iraq and Jordan. On June 6, the Pentagon announced the coalition conducted a new strike on pro-Syrian government forces as they entered the de-confliction zone with Russia and posed threat to its personnel. The force comprised of a tank, artillery, anti-aircraft weapons, armed technical vehicles and more than 60 soldiers. At least two Syrian servicemen were killed and more than 15 injured as a result of the attack. On June 8, the US-led coalition bombed pro-Damascus forces near al-Tanf in the area of a de-confliction zone following an alleged attack by a combat drone resulting in no coalition forces’ casualties. This was the third attack by the coalition on Damascus’ allies in the area. The coalition targeted a drone and trucks with weapons. Furthermore, on September 16, US-led coalition aircraft carried out four strikes against the Syrian Army near the Deir Ezzur airport, killing nearly 100 people.